The trailer opens with the game’s main protagonist, Sora, looking very amazed at the snow-covered place he is in, which turned out to be Arendelle. While Queen Elsa has already come to terms with her icy powers in the movie, the “Kingdom Hearts III” trailer implies that its plot happens at a time when Queen Elsa still thinks she is only hurting others with her gift. Shortly after, Sora, Donald, and Goofy meet the talking snowman Olaf, Princess Anna, the reindeer Sven, and Kristoff. Again, it appears that these characters come across each other while the "Frozen" characters are looking for Queen Elsa. “Kingdom Hearts III” was announced five years ago at E3 as well. 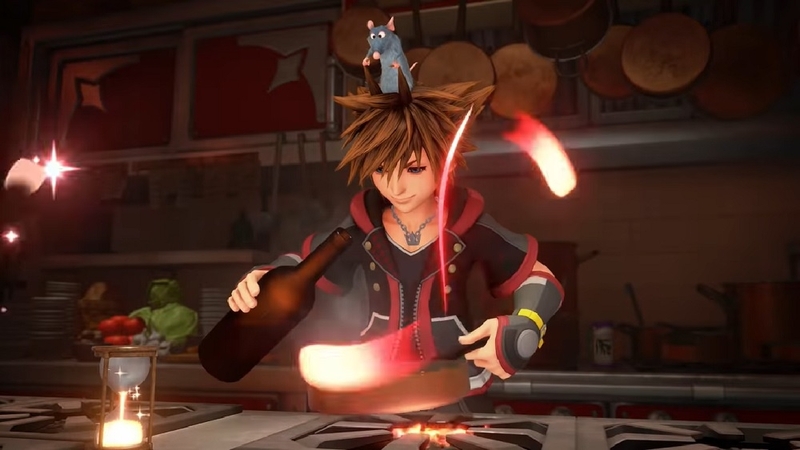 But since then many of the important gameplay details had been kept under wraps, including the new Disney worlds that Sora and his friends will explore. But the addition of Arendelle to the worlds of "Kingdom Hearts III" was leaked earlier this year. The three-minute trailer also showcases how Queen Elsa’s and Remy’s skills will be adapted to the abilities of Sora. In one scene, Sora is seen fighting monsters with weapons made of ice. Since “Kingdom Hearts III” serves as the final installment of the franchise’s “Dark Seeker” saga, it is only fitting that familiar characters from Organization XIII are also coming back to the game. The E3 teaser also confirms that the upcoming game will bring together a lot of Disney and Pixar characters to end this chapter with a bang, including Rapunzel, the guys from "Monsters Inc.," "Wreck-It Ralph," and "Toy Story." Without any delays in the coming months, “Kingdom Hearts III” will be released on Jan. 25 on the PlayStation 4 and Xbox One.